With regards the Post & Go issue, only 1st Class Strips of the new Machin will be available from the Postal Museum. I have a feeling that SG will list the Deep Scarlet 1st class stamp from the miniature sheet M17L MML as a separate stamp which means collectors will have to buy 2 of these miniature sheets which is what happened with the Long to Reign Over Us MS more expense, thanks to Royal Mail . It is up to collectors to buy it! A Catalogue is only a guide about what exist. Or do you fill obliged to buy everything what is listed in a Catalogue? I will buy it if that happens as I don't really like gaps in my album. 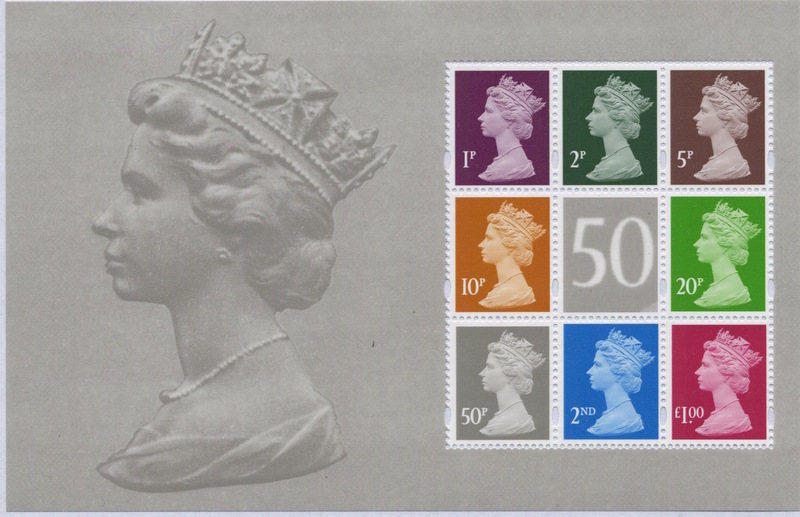 The Diamond Jubilee MMND stamp is not separately listed but included in MS3272. The Long To Reign REIGM stamp is similarly included in MS3747 but not separately listed. Stamps in miniature sheets never are. Even the AM11 1st class gold from the Arnold Machin Centenary sheet doesn't have an SG number even though the sheet contains 10 identical stamps and has been split by many people. John Deering's tables in the GB Concise don't include those variants even though the LTROU stamps exist with two year codes in many cases. Yes Ian, again I am mistaken the stamp from MS3747 is date coded O15R the stamp I got wrong was from the 90th Birthday PSB with SG3747 as the catalogue number & REIGP source code O16R date code. - b. they are also in a miniature sheet and are in the PSB in the same form as the miniature sheet, hence Darwin stamps don't have individual numbers from the PSB but Windsor Castle & Buckingham Palace do. Am I right that the stamps on pane 3 (excluding the £1) will be part of the SG 'Y' Series? I've held back for the moment in trying to guess whether any of the stamps are covered by existing SG numbers; one of the 20p double-head stamps probably is. More on this later- but probably not until July! The PANE might be printed in litho but the stamp is gold-foil embossed as is the stamp on the MS. I suspect the two stamps are the same and that no part of the stamp itself is either litho or gravure, but simply embossed. We don't yet have pane 5 so I can't do any comparison. Time will tell. Does the gold stamp have any phosphor bands on it? If it does then it will have gone through either a lithographic or a gravure press. As far as I can see, in daylight, neither has any phosphor. Meanwhile I have put in a request to the Royal Mail product manager to clarify whether either of the actual stamps is anything other than gold foil embossed. 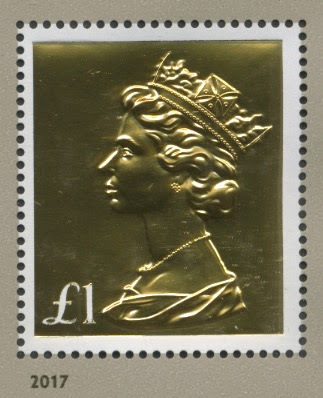 The Gold £1.00 stamp from the Miniature sheet has got a narrow (approx. 2mm)phosphor band on the left and right edge about the same width as the white border. They obviously cannot apply phosphor to the gold foil area. Indeed, with the benefit of twilight I can see that there is phosphor on the MS but not on the PSB pane. Whilst the stamp with phosphor won't get a separate catalogue number (see 19 May comments above), it is certainly a different stamp to the one that will! This might indicate two different printers even though both belong to the ISP group. Another thought is if this type of pane has been produced by an outside contractor. This has happened before. Ian, I have now seen some books and panes from the 50th Machin Anniversary prestige book and can confirm that they all have 2mm phosphor bands like the Miniature sheet! Have you found a missing phosphor version??!! The phosphor bands on the £1.00 embossed stamp from the miniature sheet must have had the bands applied before the embossing otherwise the press rollers would have flattened the embossing. The Phosphor bands on the £1.00 Gold stamp from the Prestige book are very slightly wider, so the gap between the bands is about 1mm less than those from the Mini sheet. A small difference, but quite noticeable. The phosphor bands on the Prestige book £1.00 Gold stamp are also a duller fluor phosphor compared to those from the Mini sheet, so they are not as easy to see! All the £1.00 Gold stamps I have seen so far from books of miniature sheets, have 2 narrow phosphor bands, so it might be worth checking your "non phosphor" version again Ian, before non phosphor versions get listed unless the ones you have got are "non phosphor" of course!? The £1.00 embossed Machin head from the Prestige stamp book is a different size to the embossed head on the miniture sheet version. Also when both stamps are viewed from the gum side the embossing on the miniature sheet is far more defined. So it would appear that there are two different stamps for the specialist. All items have just become available at the Royal Mail, incl. the limited edition prestige book. Thanks for the table Ian, most helpful. Just one for discussion. 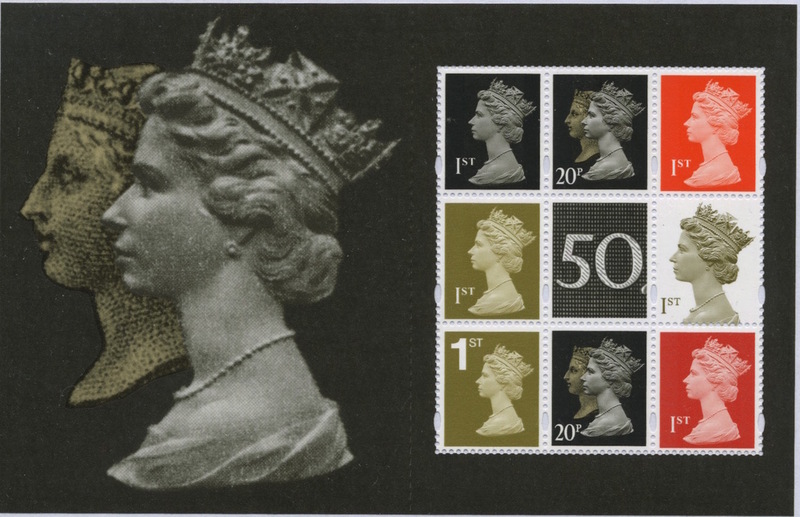 SG2955 (20p double head black) is Litho, so perhaps this may be designated as New? Good point, I had overlooked that! However, some doubt has been expressed that the PSB panes are gravure. I've been told that gravure cylinders are much more expensive than litho - and 8 or 9 would be needed for pane 3 because of all the different stamp colours. It may well be that the info we have been given is inaccurate. As always, I am checking with the 'competent authorities'. Understood. Personally, I would be surprised if the stamp panes were gravure, given that the non-stamp panes are reported to be litho. I haven't had sight of them yet, but I've polished up my magnifying glass in anticipation as it's usually more reliable than RM - litho has much sharper definition than gravure. Despite my reservation above, it does certainly seem that the Machin Panes 3 & 4 are indeed gravure. Hi, am I mistaken or is the 1st gold PIP gummed a new stamp? Walsall did the self adhesive version and Cartor have never printed it. The gummed 1st class PiP stamp is only new by the fact that this latest version was printed by ISP. We have had gummed versions in the past when De La Rue printed sheets, vertical coils and Prestige stamp book versions. Sorry Brian M & Ian, thats what I meant. Maybe a bit too specialised for many collectors? Saying that, the 20p double head Anniversary stamp was only printed in gravure by Harrisons, the rest were Litho. The 20p Penny Black double head without elliptical perforations and phosphor bands was printed in photogravure by Harrisons. The version with elliptical perforations and phosphor bands was printed in gravure by Walsall in the 'Special by Design' PSB in February 2000. Correction to my last entry. I made a mistake in saying that the Walsall PSB Special by Design had 20p double head stamps in it. They were 1st class. Sorry if I have misled anyone. Steve Martin was correct in saying the rest were printed in lithography. The 20p with elliptical perforations in the 'Treasures of the Archive' PSB were printed in lithography by Cartor.